September 27 – WTF? / What the Beep? Hi and Happy Friday! TGIF!! Today’s photo challenge is WTF? This had me stumped since what I wanted to write about didn’t have a photo with it. So, I have a short story as well as an unrelated photo. 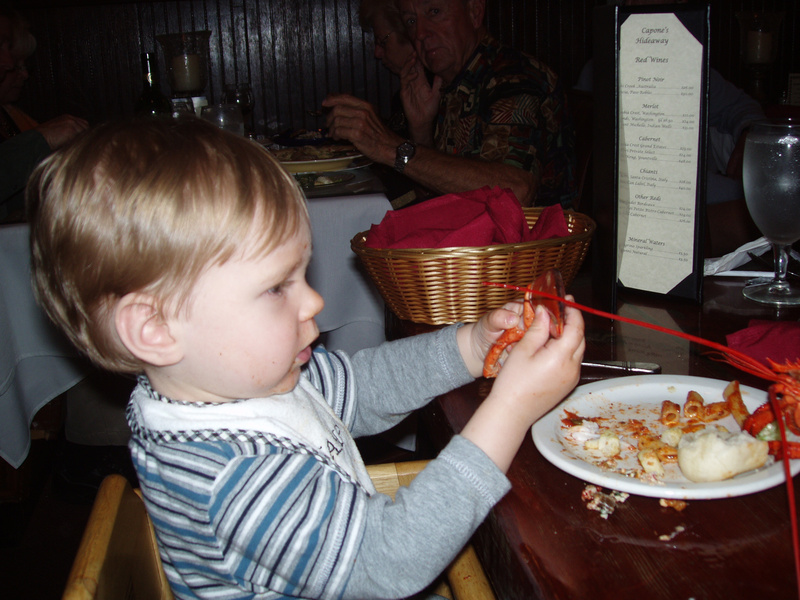 The photo is of my son and the first time he saw and tried Lobster. He was pretty young when it was taken. I thought it is funny since you can clearly tell, he’s thinking, what the heck is this Mommy? Now he wouldn’t hold a lobster or eat it. He was a better eater at a young age. But he does pretty well. For the short story, I will change the title to What The Beep? since that is the term we coined. In 2000, my grandmother passed away. My entire family flew out to her funeral in San Diego, CA. It was a sad time since we lost Grandma but she had a long life and lived to be 92 years old. So we were celebrating her amazing life, as well as the new life of my niece who was a few months old. Cousins, aunts and uncles, and my parents and siblings all enjoyed being together and all had a variety of emotions. It was great to catch up but not in those circumstances. The funeral was at the church where we always visit and was lovely. Then was the time to drive to the grave. My husband and I had rented a car and were following the hearse to the grave. We rode with my brother and his wife and son who was not quite three years old. Have you ever tried to follow someone on a San Diego freeway? It is nearly impossible. The driver we were following kept changing lanes and going very fast. It made for a wild ride and a few choice words, if you get my drift. My sister-in-law then said, we need to say beep instead since little ears are in the back seat. Thus, What The Beep? was born. We made it safely to the graveside and were able to say goodbye. Then we left and went to my grandparent’s house for a reception. That was a much calmer drive, thank goodness. This was a funny time of a very sad trip. We still use this expression today and crack up every time we do. Isn’t it odd that some of the best and funniest memories that we have are from truly awful things in our life? I think our Lord has a great sense of humor and wants us to be happy. Maybe in His own way, He was telling us that Grandma is safe and happy in Heaven and for us to carry on with our fond memories. I wonder what things today will make me say “WTF” or “What The Beep?” I just hope they will also make me laugh!! Hi and Happy Thursday! Today I get two things out of one photo. First, the photo challenge for today is Curve. I like the curve in this wooden puzzle. My son was having fun with this and all the places the shapes could go. Second is that since this was taken several years ago, it also works for Throwback Thursday. Hi and Happy Hump Day. Today’s photo challenge is H Is For… I decided to use this photo of Ian and me sitting together looking at something on the ground. Aren’t our hats fun? I love hats and wear them regularly. 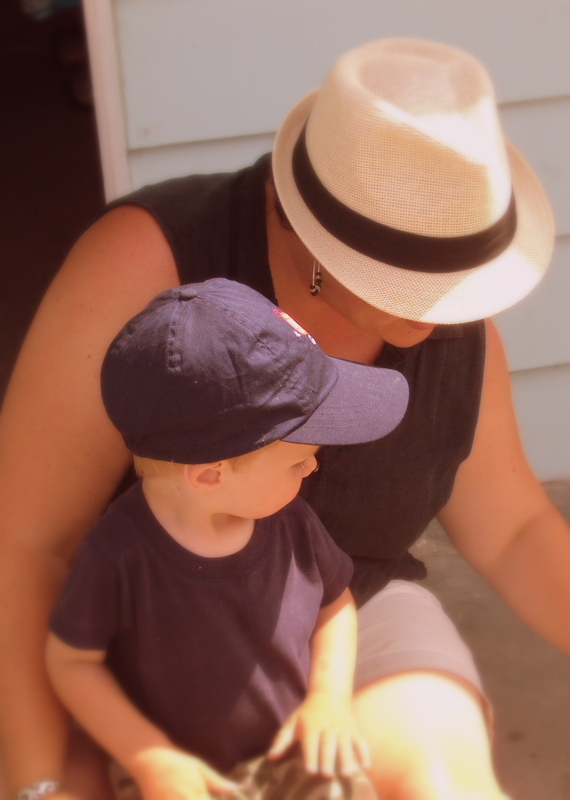 At my previous job, I was called the hat lady, something I had mentioned in a previous blog. I just wish they would come back in style. Back in the 1940s, nearly everyone wore them. Then again, maybe part of the fun is being different and unique. H is also for Hugs, which my family loves to give. We usually greet one another with a hug and then give then when we leave and go our separate ways. Hugs are a nice and easy way to let someone know you love them. H is also for Happiness. You can’t really see our mouths in this picture, but I think you can tell we were having fun and are happy. I usually am a happy person and so are my spouse and son. We love to laugh, smile, and spend time together. We are very blessed and I thank the Lord each day for these blessings. I hope that you too are happy. I wonder if my day will be filled with happiness and hugs? I sure hope so. And, I don’t want to forget my hat since I am wearing one today. Hope your day is wonderful. On Sunday, we went to the local symphony orchestra’s concert for children. This is the second year that we have attended this great concert and had a lot of fun. The theme was Thomas the Train and all things train-related. Even the songs were about trains. Among them were The Chattanooga Choo-Choo, the theme from Thomas the Train, and a song from the Polar Express movie. Ian was in his element since he has liked trains for a while now. The conductor had the kids in the audience blow their train whistles at certain parts of the show. And, the kids paraded across the stage during one song. Prior to the concert, students could make crafts and watch trains go around on a track. They also made instruments. In addition, there was a petting zoo where students could hold the instruments and play them. 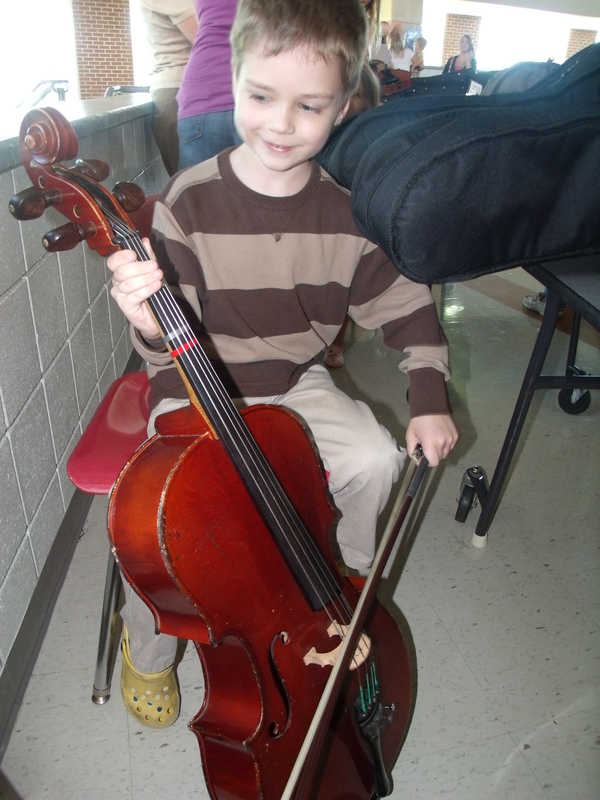 Ian had fun trying out two violins and a cello. You can see the fun he was having. 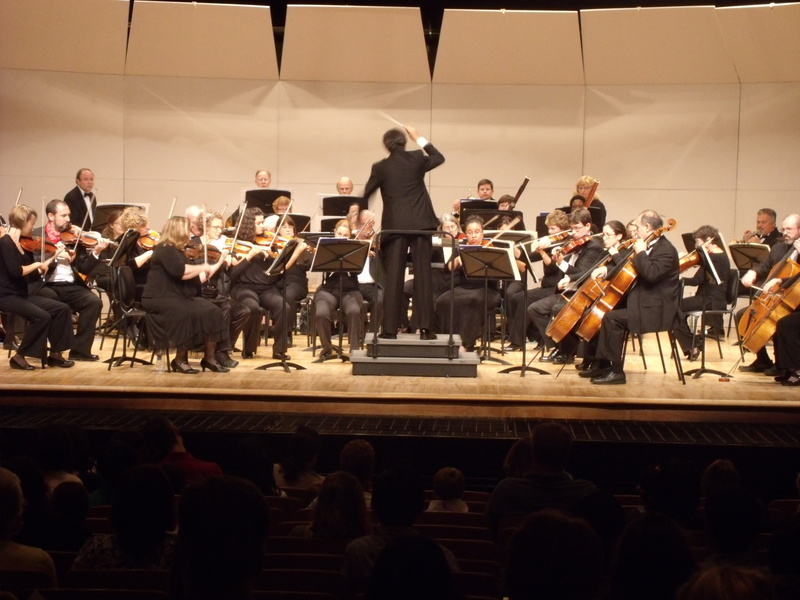 It was a great way to introduce young people to classical music. I applaud the conductor and his musicians for doing this. Bravo!! The program said that an adult can get a half-price ticket if you take a child under 18 to a concert. Isn’t that cool? They are doing a holiday concert and we’ll plan to go to that as well. The other cool thing for the day was the location of the concert. It was where I used to perform in high school chorus and drama club, and helped with lighting for the city ballet. It brought back many memories for me. They have renovated the auditorium so the sound has improved. Not only was it a trip down memory lane but a fun new time with my family, including my parents who came with us. Hi and Happy Sunday! Today, September 22, is the first day of fall. I heard on Good Morning America that it officially starts at 4:44 p.m. I always thought it started in the morning but apparently not. Don’t get me wrong, I love the summer and all of the fun we had. Summer is special in its own way, but fall is my favorite of the four seasons. In the summer, I love to be in San Diego, California, especially July. For several years we did just that and it was fantastic. So many wonderful memories, beautiful scenery, and fun people to be with. But, the fall in Tennessee and North Carolina cannot be beaten. 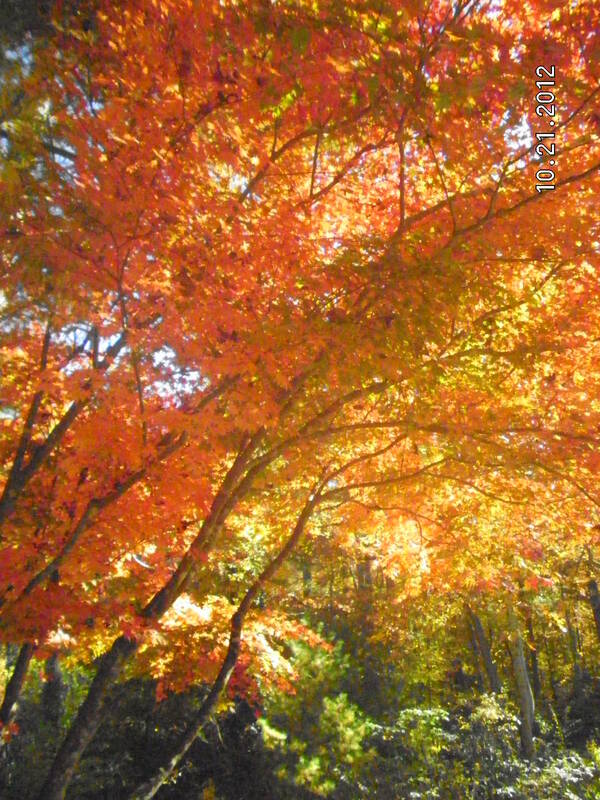 This photo I took last fall – actually in mid-October while in Flat Rock, North Carolina. Isn’t it beautiful? I love the brilliant color of the leaves. There are so many things that I love about the fall, also called autumn. Where do I start? First of all, I got married in the fall and we had a lovely wedding. And, my son was born in the fall as well. Actually both were in October. Getting to celebrate with my two guys is the best! Fall is also the time of my parents’ birthdays and two of my nephews, several cousins, and some other dear friends and family as well. Fall is a time for gorgeous yellows, reds, and oranges. It is the time for pumpkins and dressing up for Halloween. Fall is the time of screaming fans at a football game, listening to the marching band at halftime, watching the World Series on the television and cheering like crazy. Fall is the time of pumpkin spice creamer and lattes, cinnamon and nutmeg, and lots of candy. Fall is the time of wearing sweaters, the brisk air, and the changing of the trees. It is also the time of hot chocolate, hot cider, and all things pumpkin. I love eating my mother’s pumpkin bread with a slice of sharp cheddar cheese and a cold glass of milk. YUMMY. This truly is a treat for me. I also love the fall since Silk Nog is sold this time of year. I am allergic to eggs so this works for baking at this time of year. Fall is the time of crunchy leaves and brisk walks. It is the time of trick or treat, and back to school. And, the time of fall breaks, a pot of chili, sitting under a blanket reading a good book, and enjoying being inside together. 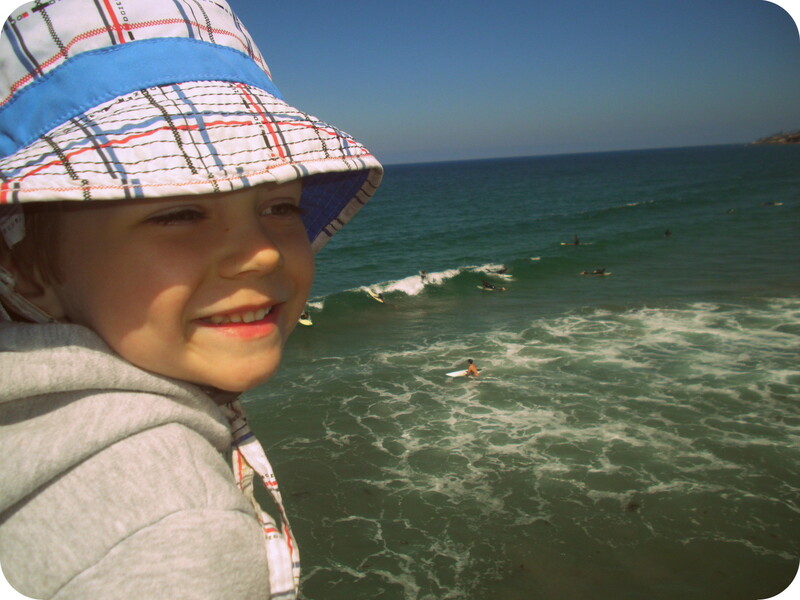 Next week, Ian will go on his first field trip – called field study. I am hoping to be able to go. The trip is to a pumpkin, fruit and berry patch. It will include a hayride, getting a pumpkin, a corn maze, time to eat lunch, and many other fun activities. Isn’t that fun? And, so perfect for fall. I wonder what fun and amazing things this fall will bring? I cannot wait to find out and see, touch, hear, taste, and smell this amazing season. TGIF!! I am so glad that it’s Friday. We have a great and busy weekend planned. I am looking forward to it and getting to sleep in tomorrow. Well as much as I can with a 5-year-old who is now used to getting up for school. Today’s Photo Challenge is In The Morning. I decided on another old picture of Ian. We were staying in a hotel on our way to Fort Pierce, Florida. This was taken just when he woke up. I just love how cute and happy he looks in this picture. Now mornings are a little more hectic with getting ready for school. Ian has five jobs in the morning that he must do before we leave. These are use the bathroom, take his vitamins, eat his breakfast, brush his teeth, and get dressed. He has gotten pretty good about quickly doing them. Well at least most mornings. When he gets enough sleep, he wakes up and bounds right out of bed. It always takes me a little longer and a few hits of the snooze button. I have never been a morning person — always a night owl — but I have had to change with school and other things going. Hope you have a great morning and weekend! Hello and Happy Thursday!! Today’s photo challenge is What Is This? I wasn’t sure what in the world to do for this. Then I came across this picture that I had taken in 2010 of Ian. He doesn’t like stuff on his hands. So, I told him that I would clean it up and then promptly did. 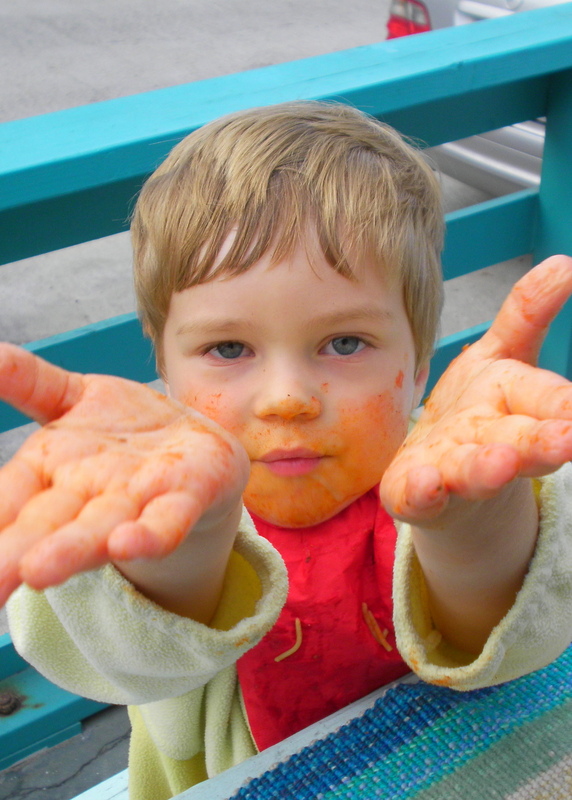 Almost every time he eats spaghetti, his face and hands look like this. And, often the clothes get messy too. We sometimes have him eat without a shirt and then he has a bath. 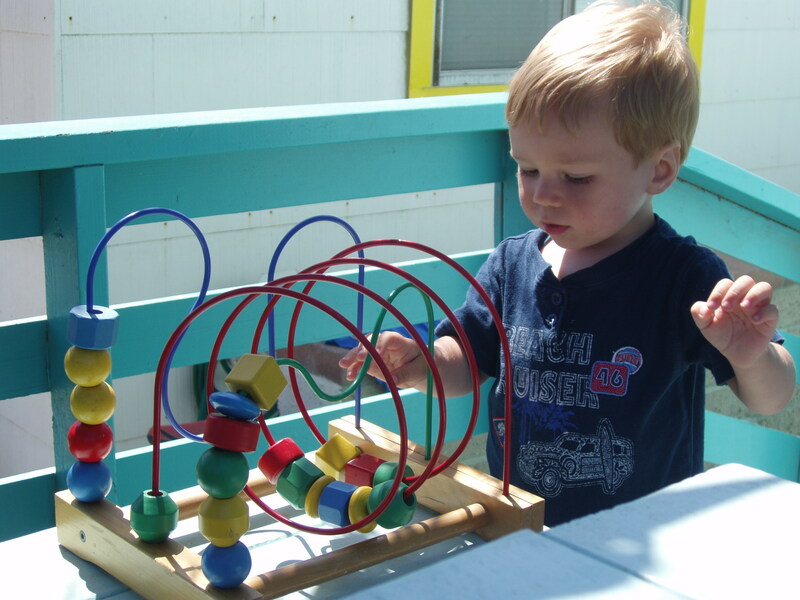 He was 2 years 9 months old when this picture was taken so I thought it would perfect for a Throwback Thursday picture as well. 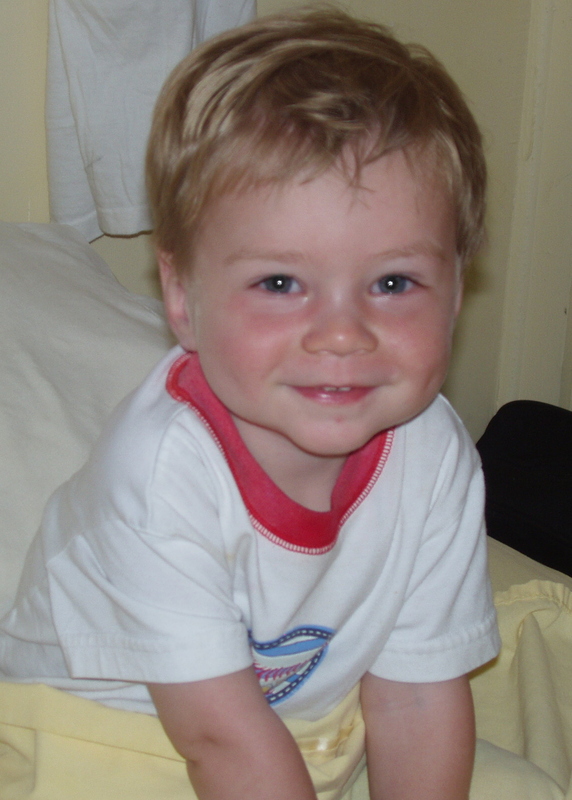 It is so fun to look back at pictures of him when he was younger. So many changes in such a short time. Happy Wednesday! Today’s photo challenge is Vintage. 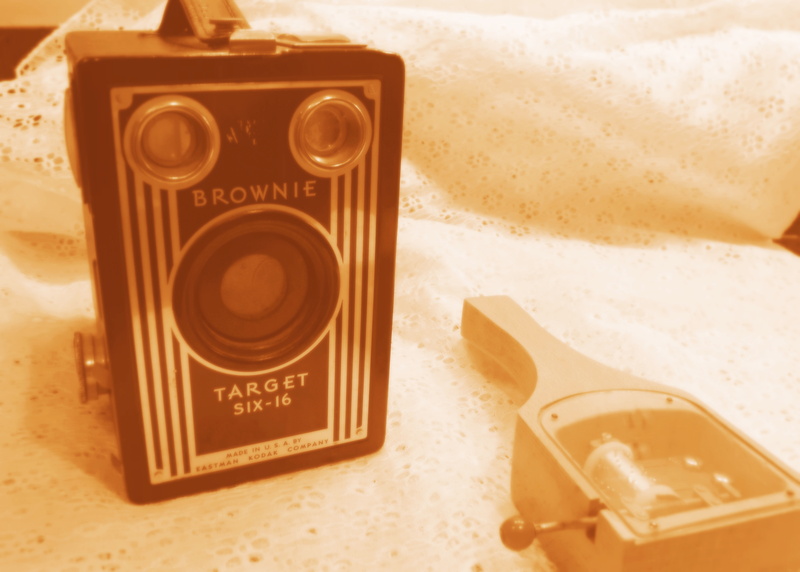 I chose my old Brownie camera and a hand-crank music box that I have had for years. Then I had fun with editing software to give the vintage look to the photo. It is amazing to me that people took such incredible pictures using the Brownie camera and then developed the film in a darkroom. This was done for many, many years. My grandfather (dad’s dad who I never knew) was an amazing photographer with a Brownie. I recently saw his collection and was so very impressed. This music box has a lovely tune that speeds up or slows down, depending on how quickly the crank is turned. Ian was fascinated with it this morning. I don’t know about you but I love Vintage stuff. It is fun to look at old photos, see items that had been my grandparents, and see how things used to be done. And, I love the vintage clothing and for that matter, clothes on sale. We just recently bought some great clothes at a Goodwill store. Have you been to one? Many treasures are just waiting to be found! What she said is so me! I so love old movies starring Cary Grant and Grace Kelly, like “To Catch A Thief.” One of my favorites is “Double Indemnity” starring Barbara Stanwyck. It is classic Film Noir and she is fantastic in it – so devious and cunning. The list of old movies that I like is actually very long. And, I love the old comedies such as “It Happened One Night,” as well as television shows with my favorites Lucille Ball and Carol Burnett. I also love wearing hats and so wish they would come back in style! At my previous job, I was called the Hat Lady, which was a name I proudly wore. I also love my old china cups and saucers that had been my grandmother’s and many other treasures from them. Mainly photos, memories, and wonderful stories. Vintage is great and something that I enjoy very much. What about you? Are you vintage or more modern? Today I wanted to share some prayers. 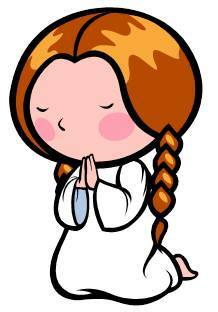 I have several dear friends and family on my heart to lift up in prayer. They are dealing with a lot of things. I hope they know they are loved and that friends and family are there to lift them up and help them through their tough times. I also want to pray for people in DC in the aftermath of the shooting this week, and the people being affected by horrendous weather in Colorado and New Mexico. There are also the fires in New Jersey, the hurricanes in Mexico, and many other things going on as well all over the world. There are a lot of things to be concerned about but also much to be thankful for. Although at times, it is difficult to see that. Lord, please stretch our your loving arms around those in pain and dealing with loss of loved ones, homes, lives, and livelihoods. In your mercy, hear our prayer. Lord, thank you for your love and devotion and being there for us always, if only we will ask. This is a great comfort. In your mercy, hear our prayer. Amen. Hi and Happy Monday. I was away from my blog for the weekend doing other things so I am a few days behind on the Photo-A-Day Challenge. Today’s word is Frame. 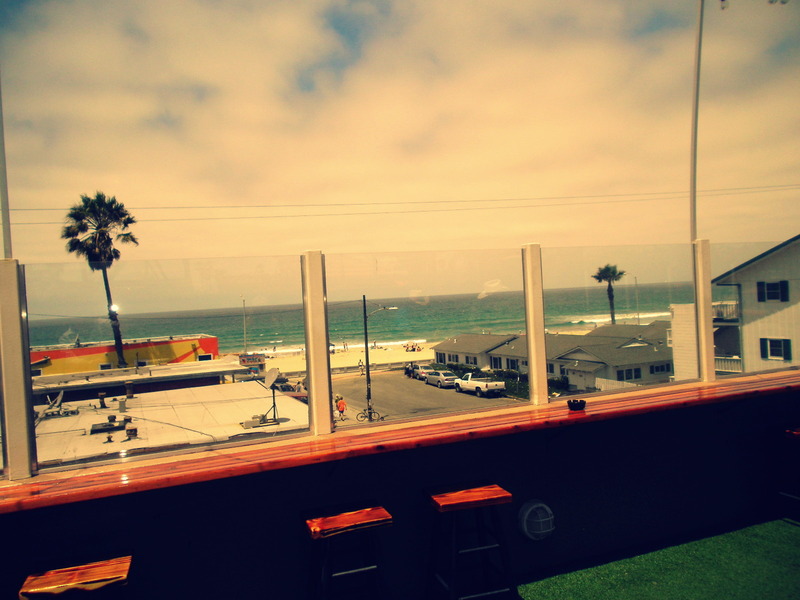 I like this photo that I took at a restaurant at the beach last summer. I love how the glass deck frames the ocean and boardwalk below. This was a stunning location for lunch. One of the times we ate there last summer, we saw dolphins swimming in the surf. How cool is that? I so love the beach and truly missed it this summer. I do have tons of photos from the last few years that I have been enjoying. On Saturday, September 14, the photo challenge was Liquid and on Sunday, September 15, the challenge was Season. I have included this second photo for both of these items. Liquid is the ocean and this is showing the end of summer. Ian is bundled up and enjoying the sun and sea. We had a great and very busy summer. We went swimming, went to a favorite pizza place, played with friends, ate ice cream, and read many books. Now, it’s almost fall and school has already been going for a month. Amazing how quickly time flies! It seems like we just started kindergarten and now we are getting into our groove and loving it. Fall/autumn is my favorite season. I am so looking forward to it. I love the change in the weather, the color of the leaves, football, the World Series, hot chocolate and all things pumpkin. It is a great time of year. I wonder what new adventures this fall will bring. I look forward to finding out.